Very few people are born with perfect teeth. In fact, many of us have misaligned teeth, and it’s only normal to want to correct the problem. Straighter teeth, after all, improve your appearance and aid your oral hygiene. While the teenage years are a good time to straighten your teeth, dental braces for adults have become more commonplace. With so many different technologies on the market, braces are more discreet and effective than ever before. Working out which is right for you, though, can be a little daunting. If you or your teen want to achieve a straighter smile, here’s what you need to know about the different types of braces available. Metal braces have certainly evolved over the past few decades and they remain one of the most popular choices for teens. Conventional braces work well for all ages and types of bites. Whether you have a small misalignment or a severe bite problem, metal braces may be customised to bring your teeth into a harmonious and healthy position. The length and extent of your treatment with metal dental braces tend to be the biggest factor when it comes to the cost of treatment. However, you are encouraged to discuss payment plans with us. Think of traditional metal braces. Now, take away the coloured or clear rubber bands and ligatures. Add a type of trap-door design that lets each bracket snap over the archwire. That’s self-litigating braces. These dental braces allow your archwire to float between your teeth, instead of pulling or pushing on each tooth. That means you can enjoy improved comfort and an efficient orthodontic system that moves every tooth systematically. What’s more, the memory archwire means your smile responds in a more efficient timeframe and in a gentler way. Self-litigating braces are a great option if you want a subtle orthodontic solution. If you’re self-conscious about having braces, lingual braces might be the answer. These dental braces are applied behind the teeth, meaning they remain unseen by others. The braces sport customised brackets that are designed to fit at the back of your teeth, out of eyesight. Lingual braces work the same way as traditional metal braces, just that they’re on the back instead of the front of your teeth. Due to the design, they can take a little longer to clean and to get used to. However, they’re an effective and proven treatment for teens and adults who want conventional braces but prefer that other people don’t see them. Ceramic braces are still a popular alternative to metal dental braces. The brackets are made out of a ceramic material that has the same texture and colour as your teeth, making them blend in with the teeth. What’s more, wires the same colour as your teeth can be used, making the treatment far more discrete. Ceramic braces are less noticeable. The bands around the brackets can stain easily if you fail to be diligent about cleaning your teeth regularly. The ceramic braces and metal wires tend to have the same level of comfort/discomfort as traditional metal braces. Clear aligners are a completely different alternative to conventional dental braces. 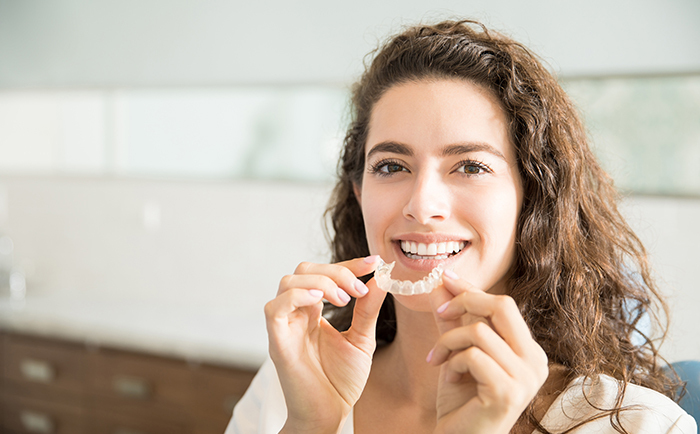 With Invisalign, you receive a series of clear plastic aligners that are custom-made to fit over your teeth and gently guide them into a straighter position over time. These clear aligners can be removed to eat, drink and brush, but you need to make sure you wear them for up to 22 hours per day. Invisalign is a popular treatment amongst adults who are socially active or have people-facing careers. They are almost invisible, convenient and may provide faster treatment time. Invisalign also produces a special type of aligner for teenagers. Invisalign Teen has been designed with certain features to help teenagers really get the most out of their treatment. It even includes an indicator to show your orthodontist that you’ve been wearing the aligners enough – or not! If your bite needs to be moved forward, Invisalign aligners are an excellent alternative to metal braces. Best of all, they are hardly noticeable! Invisalign orthodontic treatment works well for a variety of orthodontic cases, but not all issues, so if you are looking into Invisalign aligners, you’ll need to discuss this with your orthodontist. An aligned smile is an insurance plan for your teeth. Straight teeth are much easier to brush and floss. With good oral hygiene habits, you can better prevent plaque and get rid of bacteria. Both bacteria and plaque cause tooth decay. What’s more, neighbouring teeth and the soft tissue in your mouth are safe from any damage caused by a misaligned bite. Best of all, you’re never too old for a straight smile! You or your teen’s baby teeth fell out too early and it took a while for the adult teeth to come through. The jaw makes sounds or shifts, which can indicate a developmental problem with your jawline and teeth. Your teeth look crooked or crowded. If you find you’re just too embarrassed to smile because of crooked teeth, it’s time for braces. You are always biting the sides of your cheeks or hitting the roof of your mouth. This could indicate poor tooth alignment and dental braces can address an overbite or underbite. You battle to chew your food. Not only is this inconvenient, but it’s also bad for your health. Fortunately, braces can correct the alignment of your teeth. You often breathe through your mouth, which could be a jaw or tooth development issue. The best way to find out if you or your teen needs dental braces is to talk to the team at Medland Orthodontics. Come and discuss the right option for your smile!